Sometimes I wonder how my life would have been different if my baby daughter had had colic. Likely, I would have spent the days of my maternity leave from the Tillman Foundation in a sleep-deprived haze, with little energy to focus on anything other than bad (by which I mean good) TV. Instead, she was a sleeper—a great sleeper, in fact—and in the freedom of not having a day job, I decided it was the perfect time to launch a business. And so Mac & Mia came into the world just months after my second child. Obviously, to build a great business you need a great team at work. What’s not as obvious is that this applies at home as well. You need a sitter or nanny you can trust, and friends who can help in a pinch and keep you informed of what’s going on at school and in the neighborhood. And most importantly, you need a partner who believes in the vision of not just the business you’re trying to build but the life you want to lead, and who is willing to help pick up the slack when needed, lend a helping hand, and give advice. Being part of a team means communicating. One thing Joe and I have learned is that we need to set aside time every Sunday night to talk about logistics. Who needs to be where when, and how will they get there? Which one of us has more flexibility in the week ahead? Can we cluster doctor’s appointments? Are there other efficiencies we’re missing? Being part of a team also means not calling every single play yourself. Joe and I frequently divide and conquer. He makes the kids’ breakfasts and does the drop off. That means I need to let go. If he pours cereal instead of making fruit smoothies, that’s his call. If he thinks it’s fine to leave five minutes later than I would, that’s also his call. It’s the same at work—if someone owns a responsibility, while they might ask for my input and appreciate my support, they certainly won’t appreciate my second-guessing their every move. Sometimes good is good enough. I have a tendency to shoot for perfection, an elusive ideal that leaves me feeling like I always come up short. With so many balls in the air I’ve learned not to make perfect the enemy of the good. Some days my family gets a healthy home-cooked dinner, some nights (okay, a lot of nights!) it’s pizza. I try to focus on the important part: coming together as a family, not where I’ve fallen short in preparing a healthy meal. Lately, I’ve noticed the perfectionist instinct arise surrounding the kids’ activities, and have deliberately decided to push back. My kids are not doing eight different summer activities all around town, which might enhance their summers slightly, but would make mine infinitely more complicated. The day camp down the street is perfectly fine—reasonably priced, safe, and convenient. Good enough. It’s sometimes the most difficult thing, but just being present in the moment makes all the difference. When I get home at night I keep my cell phone and computer away until the kids are tucked in bed. Some nights despite my best efforts, I find myself thinking about my lengthy to-do list. When I catch myself going down that road, I try to take a deep breath and refocus on what’s in front of me and how grateful I feel for this very full life. I can’t be there for everything in my kids’ lives, but when I am there I can be engaged. Make no mistake—this is not easy. It’s teaching me discipline and a little Jedi-style mind control. The best thing any busy person can do is prioritize. When I scan my Instagram feed I’m faced with so many moms who make it seem so easy. Well, I can’t do it all–not even close. I can focus on about three things, so I try to keep my three top priorities in mind: my health (physical and emotional), my family, and my work. So that means I’m not the room mom at the kids’ school, laundry goes unwashed, and the house is often dirtier than I’d like. This simple strategy of focusing on three things instead of 300 has left me feeling more successful most days because I don’t take on more than I can reasonably handle. I would love to see more parents join me on this crazy but fulfilling path of entrepreneurship. And I firmly believe that if we are reasonable about what we can do, if we are willing to ask for help and to really and truly delegate, and if we take care of ourselves along the way, it’s entirely do-able! Marie Tillman is the founder and CEO of Mac & Mia. 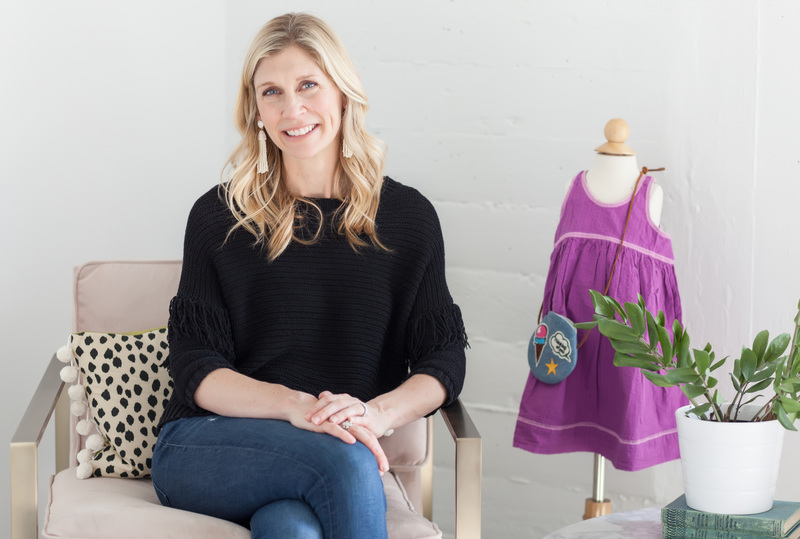 With a long standing interest in fashion combined with an appreciation and need for convenience, Chicago-based founder Marie Tillman along with her husband Joe Shenton and their five children, launched Mac & Mia to offer a solution for other parents and families like them. Marie is the co-founder of the Pat Tillman Foundation, a nonprofit that provides academic scholarships for veterans and their spouses. In 2004, in response to the nationwide outpouring of support following her husband Pat’s death in Afghanistan, Marie established the Pat Tillman Foundation together with family and friends. Marie has written a memoir about love, loss and life, entitled The Letter, which was released in 2012 by Grand Central Publishing. She has been a featured speaker at the Clinton Global Initiative University, US Air Force Academy, University of Arkansas Clinton School of Public Service, Harvard Kennedy School, Inc. 500|5000 and was named Crain’s Chicago “40 under 40” (2015).